This introduction and best practice was provided by David Spence, a Solve power-user with OfficeSpace Software. Does your organization rely on constantly following up with prospects in order to close deals and grow your business? Are you always chasing contractors or partners to deliver products or solutions, or to pay their bills? Follow-ups are a way to differentiate these routine and sometimes mundane (but necessary) actions from the real Tasks which you and your team need perform on a given date and time. Under Solve menu > Report & Update Activities the “Next actions assigned to” and “Follow-up assigned to” reports now sport two simple, yet effective features to help filter and manage these Follow-ups and Tasks. 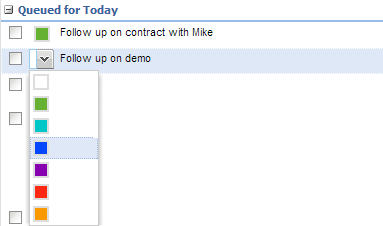 You can change the color of the Follow-up or Task directly in the reports, just like to can reassign it or change the date. Simply double-click on the color and choose the new one. Adding context to Follow-ups and Tasks makes it easier to prioritize the important ones from the not so important ones. Sales teams and other parts of your organization can use these filtering options to help prioritize the Follow-ups and Tasks. Maybe you are using green to note high potential leads where things are moving forward in the right direction, orange for medium or luke warm leads (e.g. no progress yet, call me in 2 months), and red for those pesky prospects who you haven’t been able to reach but you keep wishing one day you will be able to get them on the phone; or you can just kill them off your list and move on to better opportunities. Maybe a prospect starts out hot, then warm, then cold then disappears. 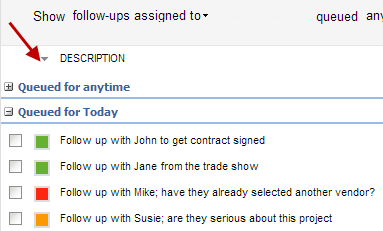 Another idea is to keep track of the phone calls and emails you have made to these prospects or contacts in the Follow-up description, allowing you to quickly see the call and email history right there: more context to go along with the color which you’ve applied. Here is a real case example. 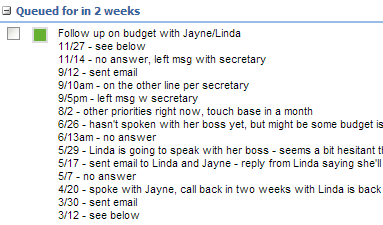 If there is significant discussion you can log that in a Call Log below the follow-up. What about all those follow-ups that you will get to when you’ve got time? Consider removing the date and leaving them in the “Queued for anytime” section. This will free up today, and future dates for the better Follow-ups. Block off some time each day to call or email these prospects. If you left a message for them today then add a date of 4-5 days from now to follow up to try again. If you don’t get them on that specific date, remove the date and put them back into your “Queued for anytime” list and keep repeating the process. Keep trying, eventually you’ll get them or change the color based on your instincts and eventually kill them off your list if they are non-responsive. A sales person constantly chasing luke warm or cold leads gets desperate and has a lower closing rate. It’s better that they kill these off and find new prospects to add to the pipeline. Nothing matters in your business until you close the deal, right? These simple changes, along with some disciplined best practices, will help your team to be more effective and win more business!